The resources, advice and insights needed to design long-lasting, reliable industrial systems from the pioneer in CPVC material. The food and beverage industry depends on processing materials that will not contaminate the supply. When De Marne's stainless steel mustard piping system became compromised, they turn to an alternative material that could withstand the acidic and high temperature conditions of its line. About De Marne Since its startup in 1895, De Marne has been a major producer and world exporter of mustard. Named the official mustard supplier to the Royal Family, it’s highly regarded by consumers across the globe. Their products are available in all Dutch supermarkets, and are exported to many parts of Europe, the United States, Canada, Africa, New Zealand and Australia. The De Marne product presence is also expanding in eastern countries, such as Hungary, Czech Republic, Slovakia, Bulgaria, Romania and Poland. When corrosion was plaguing a previous system of piping and tanks, De Marne found a material that has now delivered reliability for more than a decade. The chemical processing industry (CPI) continues to be a tough environment for creating safe composite structures that mitigate corrosion degradation. Today, more design engineers and material specifiers are calling for fiber reinforced plastics (FRP) in both new and replacement equipment used in chemical processing operations. B&D Plastics is a fabricator of dual laminate structures. Their unique fabricating process allows for the handling of fluids at very high temperatures and is impervious to corrosives. To develop products capable of standing up to its customers’ demanding applications, B&D Plastics specifies Corzan® chlorinated polyvinyl chloride (CPVC) manufactured by IPEX USA. Delve deeper into CPVC's capabilities, benefits and performance in the harshest industrial applications. When the Environmental Protection Agency (EPA) published the Cluster Rule in 1998, pulp and paper manufacturers industry-wide began to make operational adjustments to become compliant by April 2001. Aimed at reducing emissions, the Cluster Rule called for the introduction of uniform pollution prevention and control technologies. For Smurfit-Stone Container Corporation, that meant a major reconfiguration of its bleached market pulp operation in Panama City, Florida, including extensive changes to its bleach plant. The corporation relied on BE&K Engineering Co. to identify cost-effective construction materials that would provide reliable performance in the harsh environment. Industrial applications create some of the harshest conditions to which a material can be subjected. Consequently, the materials intended for use in these environments must be especially resilient. For instance, extremely corrosive chemicals essential in applications, such as chemical processing and wastewater treatment, must be stored, processed and transported safely and effectively. This requires containment materials that possess very high corrosion-resistant properties. The vessels designed to contain these chemicals have been traditionally composed of steel, fiberglass or exotic alloys, but chemical tank manufacturers have learned that the lifespan of these materials is limited by their inherent chemical resistance qualities. As a result, fabricators have begun the practice of adding more robust chemical-resistance layers into dual-laminate tanks to create longer-lasting containers. This has directly helped to limit the amount of downtime manufacturers must endure related to repairs and tank replacement. In 2006, Netherlands-based AkzoNobel Base Chemicals B.V. constructed its chlorine plant based on Asahi membrane electrolysis technology. Based on current experiences with chlorinated polyvinyl chloride (CPVC) in its Rotterdam-Botlek plant and recommendations from AkzoNobel Technology & Engineering in Arnhem, plant engineers chose Corzan® CPVC for its pipelines (total 1000 meters or 3280 feet). 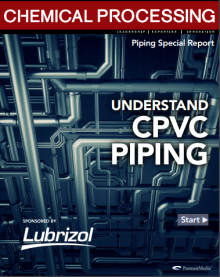 Specific applications included: Shower system using standalone CPVC Wet chlorine using FRP / CPVC Anolyte using FRP / CVPC A Corzan CPVC piping system offered a number of advantages over other piping options, as well as versatility across many distinct needs. Past Performance of Corzan CPVC System Proves Claims of Durability and Cost-Effective Service Life In 2005, and again in 2006, a Colorado-based litho plant decided to modify its two aluminum substrate manufacturing lines to increase capacity. Because of its already well established reputation, there was only one piping material considered by the engineering design team – Corzan's chlorinated polyvinyl chloride (CPVC). This is because the high-performance material had already proven it provides an extended service life, improved process utilization and lower life-cycle costs. It had been doing so since 1992 when it was first used on a new fluid handling line at the manufacturing center for medical x-ray film, photographic papers and aluminum lithographic printing plates. Nearly 15 years later, that schedule 80, CPVC line was still fully operational, providing the necessary corrosion resistance and mechanical strength to effectively handle the harsh chemicals being pumped under pressures up to 80 psi at temperatures up to 180˚F without leaks. When Goodrich’s Aerospace Landing Gear Division changed its chromium emission control system from a wet-pack scrubbing system to dry-mist eliminators, it wanted to be certain it satisfied Environmental Protection Agency (EPA) requirements. The system designer / supplier provided two separate systems for Goodrich, each serving half of the company’s chromium processing lines with the capability of changing from one to the other in the event of an emergency. The company designed a system well below the MACT standard of 0.015 mg/cu meter. The two systems were installed in December 1995 and January 1996. When independent test data was collected and tabulated in July 1996, both systems were at least 10 times better than the designer’s criteria and even lower than the 0.015 mg/cu meter required by the MACT standard. Can CPVC Piping Systems Be Applied in Sulfuric Acid Plants? Sulfuric acid is one of the most dangerous chemicals in the world. Because of its corrosiveness, high concentrations can cause expensive damage to industrial machinery, and even weak concentrations can cause eye, nose, throat and skin burns in people, along with chronic respiratory damage in case of long-term exposure. However, when processed and handled properly, sulfuric acid is one of the most useful industrial chemicals in the world—an important ingredient in fertilizer, batteries, detergents and other products that are used around the world every day. Sulfuric acid is a by-product of zinc. When zinc ore, which also contains sulfur, is heated to 1750°F (950°C), it releases sulfur dioxide gas, which is then collected, cleaned and processed into sulfuric acid. At Delta Air Lines' Atlanta-based Technical Operations facility, the landing gear of its entire fleet is taken apart, cleaned, metal-plated, and put back together again. A polyvinyl chloride (PVC) system was servicing the ventilation needs in the facilities plating shop, operating under highly aggressive chemicals, very high temperatures, and corrosive conditions. When the system began to fail, Delta knew it had to be replaced by a stronger, more chemically resistant material that could withstand the facility’s corrosive environment. The engineers found the solution to their problem in Corzan chlorinated polyvinyl chloride (CPVC). Copyright © 2019 Lubrizol | All Rights Reserved.